I remember, my friend didn’t give it a second thought, as soon as he saw the spider cross the room, he just grabbed a used newspaper, rolled it up and BAM! Smashed the insect flat on the ground. Then he got angry because the poor thing’s corpse had stained the kitchen’s floor. What makes us care more for a puppy than for a spider? Both are animals, but they’re looked upon differently by humans. Sure, it’s more difficult to identify with spiders. And killing them is not punished by law. What if spiders could moan, though? Would their condition improve in a human dominated environment? Would they be worthy of our compassion, then? The set of rules that defines who has the right to live and who doesn’t revolves around our personal interests, but we could function differently. In Buddhism for instance all life forms are considered important. Not because they’re smart or useful, but because they can suffer. I we lived in an evolved society, we would probably stop killing bugs for the sake of it. Talking about a small change to make in our daily life, that could be one. A small change that might end up making a big difference. 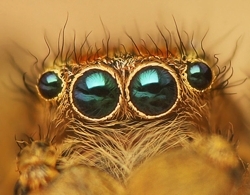 BTW – a tip for nervous spider picker-uppers – coax them into a glass – they can’t climb up the shiny surface. Thanks for sharing the tip, David, I’ve noticed that the combined use of a glass + a sheet of paper makes a great trap for nearly all crawling and flying bugs.